The state of Minnesota and the business and culture of beer underwent many major changes from statehood in 1858 and for the next 25-30 years. 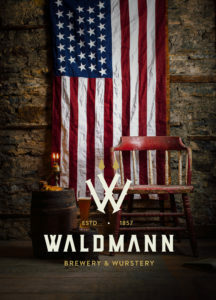 As settler and immigrant populations flourished and transformed, so too did the beer industry in Minnesota, reflecting new cultural influences. Doug Hoverson teaches social studies and coaches the debate team at St. Thomas Academy in Mendota Heights, Minnesota. He is associate editor of American Breweriana Journal, an award-winning homebrewer, and a certified beer judge. He is also the author of Land of Amber Waters: The History of Brewing in Minnesota, published by the University of Minnesota Press. 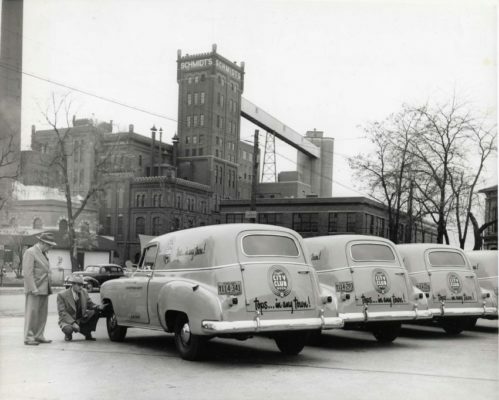 Image: Black and white photograph of two men inspecting Schmidt City Club Beer vehicles at the Schmidt’s Brewery. Dave Froge and Rory Potville are at the front of one vehicle. From the RCHS Photo Collection.